Two key features that differentiate birds from other animals are their feathers and their hard-shelled eggs. This kit explores both. All birds have feathers, even those that aren’t able to fly, such as the ostrich. They are good for keeping a bird warm, waterproof, camouflaged, and in season, attractive to mates. Feathers give wings their lift and birds their colors. Feathers are attached to wings, remarkably designed structures that are strong, lightweight, and clad in aerodynamic, insulating feathers. Some wings are ideal for the open skies, while others, like penguin wings, for flying underwater. Birds shed their feather, sometimes mid-flight, but usually when preening. All birds lay eggs as part of their life cycle. Hatching birds often leave egg fragments in the nest or on the ground below, offering clues to a possible nest overhead. Eggs, egg fragments, and feathers are classic bird signatures, providing important clues to bird life in the area. 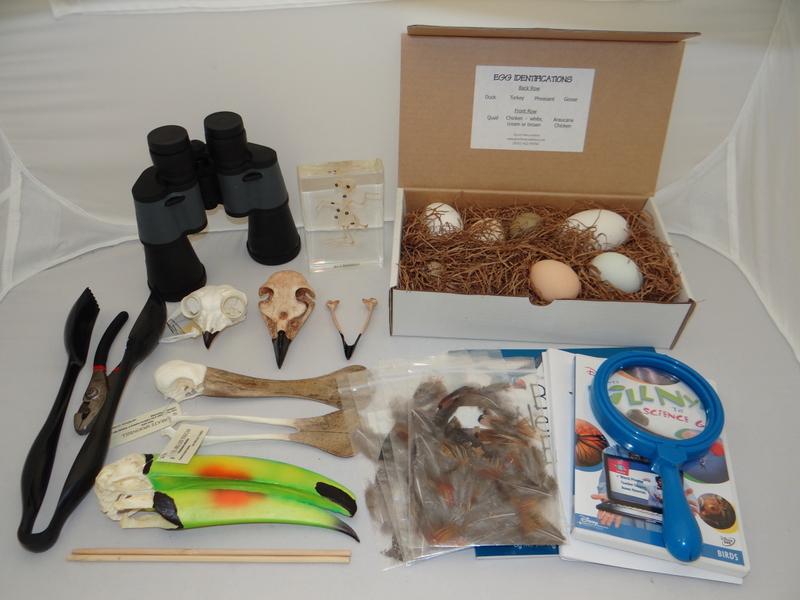 *This kit is a nice complement to our For the Birds exhibit. In this kit: This kit contains seven different cleaned, infertile eggs that have been collected from domestic barnyard fowl (coturnix quail, ringneck pheasant, two different varieties/colors of chicken eggs, plus duck, goose and turkey). In addition, five different feather packets from domestic birds—over 50 naturally shed (not plucked) feathers—are also included. The feathers represent a variety of colors, species and feather types. All feathers are from domestic barnyard species.Replica skulls from Toucan, Ibis, Great-horned owl, Spoonbill, and activity guide Additionally, magnifying hand lenses (with protective slip case), and this activity guide complete the kit contents.